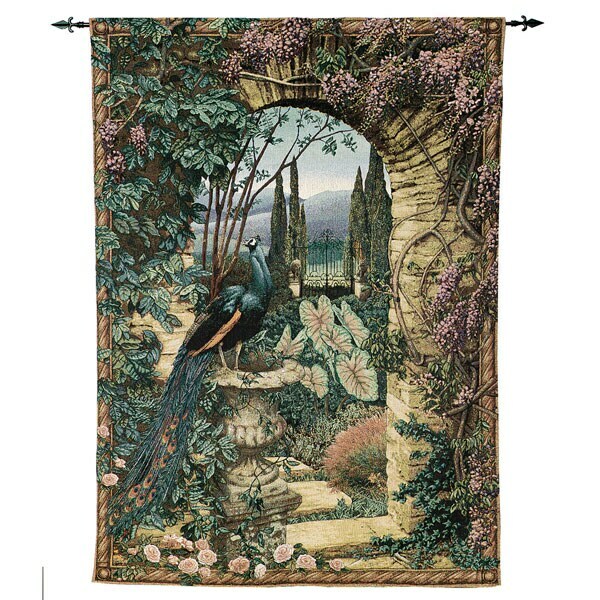 Walk past the peacock, through the stone arch and into a dreamy world, where flowers bloom and cypress trees frame an iron gate that opens to purple hills. A glorious fantasy, jacquard-woven in the USA in a family-owned mill in the Blue Ridge Mountains. Cotton-poly tapestry is fully lined and grandly oversized at 56" x 77". Comes with a bottom weight rod. Metal hanging rod (XB1472) sold separately. Expands 60"- 108". Finials add an additional 4" on each end. Comes with brackets for hanging.